The Blue Jays are looking at pitchers Ervin Santana and Ubaldo Jimenez. The Toronto Blue Jays, in need of another starting pitcher, might finally be preparing to pounce. The Jays have yet to make an offer to a free-agent starter, according to major league sources. 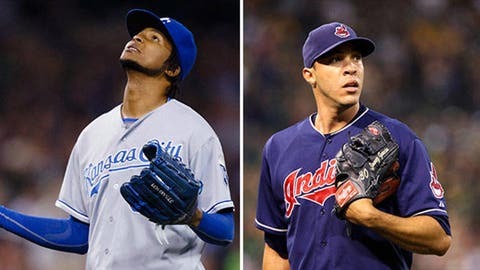 But they have done extensive background work on right-hander Ubaldo Jimenez, digging into his medical records, and also remain interested in righty Ervin Santana and other free agents, sources said. Both Jimenez, 30, and Santana, 31, received qualifying offers from their previous clubs, forcing any other team that signs them to forfeit a high draft pick. The Jays, however, are in better position than most teams to sign one of the two – they hold “protected” picks at Nos. 9 and 11, and the first selection they could lose is No. 49 overall. For now, the Jays continue to wait out the market; general manager Alex Anthopoulos told reporters in Toronto on Wednesday night that free agents are becoming more appealing as their prices drop. The team’s background work on Jimenez and the likelihood he will require a less expensive contract than Santana does not necessarily mean that he is the club’s preferred choice, sources said. No, the Jays are assessing all options, including trades and bids for free-agent righties A.J. Burnett, 37, and Bronson Arroyo, 36, neither of whom would require the loss of a draft pick. Jimenez and Arroyo require additional study because they are less familiar to the Jays after spending the majority of their careers in the National League. Santana has pitched only in the AL, and Burnett was a member of the Jays from 2006-08. In addition, Jimenez raises a number of concerns for clubs, from his unorthodox delivery to his high walk rate, his declining velocity to his poor first half last season. Santana, due to his makeup and delivery, is considered by some teams to be a safer bet. The Jays’ current projected rotation includes right-handers R.A. Dickey and Brandon Morrow and lefties Mark Buehrle and J.A. Happ. The team also has explored trades for Tampa Bay Rays left-hander David Price, Chicago Cubs right-hander Jeff Samardzija and others this off-season.